LED type: 5050 SMD. 4 x 9 SMD LED strip lights. High quality RGB LED strip lights, waterproof, anti-collision, anti-corrosion. Strip light Cable Length:2 140cm 2 190cm. Application: Using for lighting up the entire car interior, plug and play. High quality RGB LED strip lights, waterproof, anti-collision, anti-corrosion. luminance; Strobe & Smooth. Strip light Cable Length:2 140cm 2 190cm. 5050 SMD LED strip lights. Application: Using for lighting up the entire car interior, plug and play. Canbus Error Free. 1 X Led Cab Interior Light. Unlike many led bulbs on the market these are superb quality. 2 X Led Rear Light's. Superb Quality CREE LED. Super Bright White. 2 X Led Map Reading Lights. Commonly known as 380 / 1157 / Bay15d fitting. Canbus SMD error free technology. Built in resistor which will prevent any dashboard errors and repeat flickering. Bayonet bulb type: 380. Beam pattern: 360°. Canbus Error Free. 2 X Canbus Error Resistor. For VW T6 Led Fog Light Bulbs & Resistors. 2 X 6000K Super Bright H11 Led Bulbs. Easy To Fit. Decorative your car by this RGB LED Strip Lights, changing the atmosphere with different color and lighting mode. Enjoy a beautiful, exotic and romantic atmosphere. Change your car atmosphere by this LED decoration strip, Enjoy the romantic atmosphere. Canbus error free. Wedge bulb type: 501 (W5W). Each bulb is made from silicon material. Can be installed anywhere that takes the 501 fitting: Sidelights, number plate, interior etc. Colour temperature of between 5500k & 6000k can be achieved. Commonly known as 382 / 1156 / Ba15s fitting. Canbus SMD error free technology. Built in resistor which will prevent any dashboard errors and repeat flickering. Bayonet bulb type: 382. Beam pattern: 360°. High quality RGB LED strip lights, waterproof, anti-collision, anti-corrosion. Strip light Cable Length:2 140cm 2 190cm. 4 x 9 SMD LED strip lights. Application: Using for lighting up the entire car interior, plug and play. Canbus error free. Wedge bulb type: 501 (W5W). Can be installed anywhere that takes the 501 fitting: Sidelights, number plate, interior etc. Colour: White. Colour temperature of between 5500k & 6000k can be achieved. New VISION LIMITLESS SERIES BULBS ! Up to 120% More Light ! Up to 20% Whiter Light ! Bulb Base: PX26d. Up to 35m More Distance ! Good quality. OTHER ACCESSORIES. Light colour: RGB. LED Type: T10 5050 SMD LED. 2 x T10 LED Car Lights. Before installation, kindly cut off the power switch and turn the lamp off Super brightness with the best qualified 5050 SMD LED. VW T6 Rear LED Reversing Bulbs 15 Onwards. Will fit all T6 models 2015 onwards twin rear or tailgate. 2X Led reversing bulbs. Canbus error free. Fizzmo is all about the people. Pair of BMW Angel Eye 20w 7000k White CREE LED Marker Bulbs. One bulb per side of car - each bulb lights up two angel eye rings. The following BMW must have aH8 bulb fitted in order for these led angel eye bulbs to fit. 2x Premium 12V W5W upgrade LEDs. Latest CANbus Technology. Using LED bulbs may trigger a bulb failure on your dash this is because LED's use less power than a standard bulb, which vehicles would recognize as a bulb failure. Super bright 5050 SMD RGB waterproof strip color changable LED, Flash, high intensity and reliability. 4 x RGB Strip Light. 1 x USB Connect Cable. Multi-colors: Allow you to changing the light with more colors. 10 x 380 12v 21/5W BAY15D Bulbs. Twin - Stop and Tail Bulb. 380 Type Bulb. High Power CREE 50 Watt Sidelight LEDs. 2 x 50w CREE Canbus Sidelight LEDs. LED: SUPER BRIGHT CREE, 8 side CREE 5W and 2 forward firing CREE 5W with projecting lens. POWER: 50W (10 X 5W) CREE LED. COLOUR: CREE Super White (no hint of blue). 2 X H1 Super White Headlight Bulbs. Fit directly in place of original bulbs - no rewiring necessary. 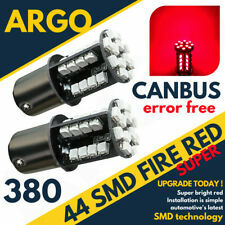 Canbus SMD error free technology. Built in resistor which will prevent any dashboard errors and repeat flickering. Wedge bulb type: 580 (W21/5W). Commonly known as 580 / 7443 fitting. Important notice: The compatibility chart above is for guidance only. Cross Reference Part Number: H11 H9 H8. 2 x H11 H9 H8 COB Light Bulb. Decoders: 50W 8-Ohm Error Free Load Resistors Decoders. 2 x 50W 8-Ohm Error Free Load Resistors Decoders. Type: Car LED Bulb. Light Color: White. (☆ 2 pieces (a pair) of 40 high power SMD LED 582 7440, 580 7443, 992 Light lamp bulbs. Cross Reference for this 7440 or 7443 LED light bulb The compatibility chart above is for guidance only. 6) Emit 6000K xenon super White color. FOR the vw T5 T5.1 T6 Caddy plus caddy maxi. Vw Interior Map reading light unit & led upgrade bulbs new genuine vw light. Interior light unit & led error free upgrade bulbs. NEW complete light unit with led bulbs. For VW T5 Transporter Kombi Led Bulb Upgrade. This will upgrade your normal halogen side step light to a bright white led version. Great Quality Led Bulb. Bright White 6000K. Canbus Error Free. Light colour : Pure White 6000K-6500K. CE and ROHS Approved Bulbs made to our own specification. 2 X 8 LED SMD Lights to upgrade your Map lights. 1 X 42mm 8 LED SMD Festoon to upgrade your Main light. 2 x Blue 501 Sidelight Bulbs. Bulb Capless 12v-5w. They are easily used to replace existing bulbs and require no modifications to fit. Beam pattern: 120°. Colour: White. Important notice: The compatibility chart above is for guidance only. 501 LED bulbs. Qty Included: 2 bulbs. Wedge bulb type: 501. All our bulbs are sourced from quality suppliers. Power: 48W (3W LED 16pcs). Shell Material: Aluminum,fast heat dissipation,resistance high temperature. Waterproof, shock and vibration resistant. Mounting Bracket: Stainless Steel,rust-proof and waterproof. BMW F31 Estate (3 series) interior L.E.D kit this kit will update the following. This kit makes a huge difference for a fraction of the dealer prices. Easy plug & play installation there are no modifications required. LED dash bulb kit for LEXUS IS200. Very easy to fit and makes a great difference to your dash. High quality RGB LED strip lights, waterproof, anti-collision, anti-corrosion. Strip light Cable Length:2 130cm 2 180cm. Application: Using for lighting up the entire car interior, plug and play. 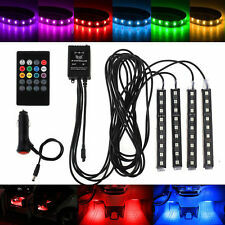 LED lights Color: Red, Green, Blue, White, Orange, Yellow, Cyan, Purple. For Honda Civic 2001-2005. Remove the two screws in the top of the plastic trim in front of the gauges. Type R / Sport. Wedge Bulb Type: 501 (W5W). Colour Temp: 6000K (cool white). 2 x 501 LED Bulbs. Canbus: No - if bulbs failure warning lights are on, LED load resistors may required. Super Bright Crisp White Lights. LED version: High Power. NEW 2 X T20 XENON EFFECT SIDELIGHT/DRL BULBS. Seat Mii (halogen headlight models only). Audi A1 (halogen headlight models only). Audi Q3 (halogen headlight models only). BMW 1 Series (F20/F21) (halogen headlight models only). Fizzmo is all about the people. Pair of BMW Angel Eye 5w 7000k White CREE LED Marker Bulbs. Fitted with the latest CREE 5w led chip imported from the USA (per bulb). One bulb per side of car - each bulb lights up two angel eye rings. Headlight bulb type: H4. Technology: Xenon gas. Beam pattern: Surround glow. Colour: Ice blue. Any yellow which is normally shown is filtered down by the blue lens on the bulbs giving up to 50% more brightness than standard bulbs. 7443 xenon white bulbs. Also known as 580 / T20 / W21/5w fitting. Technology: Xenon. Plug & play, simply remove your existing bulb & put this one in it's place. As they are xenon bulbs no resistor is required. 2 X 8 LED SMD Lights to upgrade your Map lights. Light colour : Pure White 6000K-6500K. Reduces the load on your wiring. Improves visibility and brightens your interior. Easy to install - Plug and Play. Give your VW Transporter the LED lighting it deserves. Remove your existing bulb & replace with your new LED bulb. 1x LED Cab Interior Light. 2x LED Side Step Lights. For VW T5 T5.1 T6 Interior Light Unit & Led Error Free Upgrade Bulbs. 2X Map reading CREE led bulbs. 1X Interior CREE led bulb. Complete light unit. W204 C-Class 2008-2014 SEDAN(Fit 4 Doors Only). When you open the door, you’ll see a LED light projection welcoming you which emanates charmingly. Super Bright LED and SMD Technology. No need for drilling, cutting or modification.